I was contacted by an employee of Windsor Pride who provided that their rent is approximately $1,000 per month plus utilities, not $1 per month as reported in some media. Canada South Festival Network does pay $1 per month plus utilities. This new information doesn’t really change the situation the Pride and CSFN are in and without knowing the exact number of square feet both organizations occupy it is hard to compare these rates to other possible locations or to know exactly what they can afford. This week’s Windsor City Council meeting (June 15) could see the face of downtown Windsor change. The question is, will Council take a step forward and ensure a viable and prosperous downtown or a step back? The first issue is the fate of ground level commercial units situated under the parking garage at Pelissier and Park St. In the report to Council, administration offers three options: maintain the status quo of parking and commercial units; remove all of the commercial units and replace them with ground level parking, or replace half of the units with parking while maintaining the other half. From a dollars and cents stand point it is a pretty straight forward decision. With only 3 of 7 units occupied, and only 1 of those tenants paying a full and fair market value, removing the commercial space will not only save taxpayers but provide parking downtown. 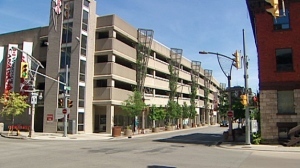 With an upfront cost of approximately $500,000 to create 42 new ground level parking spots, the spots would generate revenue based on demand for the city and have little ongoing maintenance costs. The other two options both require costly repairs to the existing parking structure ranging from $1.3-$1.8 million due to past water leaks leading to mold growth in the commercial units below. Although a waterproof membrane was added to the parking levels, ongoing maintenance of this membrane do carry costs going forward as does additional upkeep on the units. The major reason against the removal of the commercial units is the disruptive impact it would have on the Pelissier streetscape, as the block would lose walkability and the potential for new businesses to take over those spaces. The Downtown Windsor Business Improvement Area has come out against the removal of the commercial units. This really isn’t surprising given the reasoning above as maximizing commercial options in the downtown is their mandate and if any tenants were to be found for these units they would become paying members of the BIA. To counter the recommendation to Council, the BIA has started a petition, posted videos and put forward a business plan that would see them takeover the units. Regarding the issues of repairing and maintaining the units on Pelissier, both sides have valid points. The streetscape will likely be irreparably changed by the removal of the commercial units as turning a large chunk of a block into a parking lot does not really add a positive experience in the downtown core. On the other side, to ask taxpayers to foot a $2 million bill to repair the commercial units is expensive and makes the assumption that those units can be filled when there is so much retail space available downtown. Unfortunately these costs may not have been so high if the city had better maintained the spaces. Caught in the middle of this debate are three existing tenants who haven’t had much say in the outcome. Although I would assume that they will join the BIA and make their case at Council on Monday, these tenants face serious consequences should the city choose to evict them. One tenant is a private business, a hair salon, that has been in operation on Pelissier for several years. I don’t know much about this business but like most hair salons it is likely a family or individually owned small business with a dedicated clientele, some of whom may nor may not follow them if they are forced to abandon their current location. The other two tenants: Canada South Festival Network and Windsor Pride are not for profit organizations, each paying rent of $1 per year to the City for their building costs. * For them, the risk of being moved from Pellisier street could be financially catastrophic. Although I do not have any knowledge of their organizational finances, I would assume that like most not for profits they are supported on a shoestring budget of grants and donations. As a result, any increase from their $1 rent to a property tax basis rate or a market value rate could dramatically impact their financial situation which in turn will hurt their ability to offer support to the community. Even the proposed 6 months vacancy period is difficult for these organizations as they budget on an annual basis and having to deviate from the budget can cause major difficulties in supporting the programming they offer. The second issue is the fate of Windsor Water World which is returning to Council. In January this issue went before Council and was deferred for 6 months while administration examined alternatives to closure and community capacity to handle programs that are currently offered in the facility. The report goes to Council this Monday recommending drastically reducing Water World’s hours of operation but keeping it open for the after school and early years programs. The justification for this change is largely around cost savings, based on the fact that at some point Windsor Water World will be replaced by a high school and that this centre has poor usage compared to other community centres in the city. I have expressed my views on keeping community hubs open in Windsor (here and here) and this situation clearly fits into a similar paradigm with the City’s own actions at least partially contributing to Water World’s decline. In my opinion, the decision to move a new catholic high school to this location means that in the eyes of administration, Water World is a redundant facility that should be shuttered as a means of cost savings. Unfortunately, there is no sign that the new high school is on the horizon. In the January Council meeting it was implied that a decision would be made on the school this spring, the new report now indicates a fall decision. Given the Catholic School Board had to dip into its reserves to balance its budget this year, there is questions of whether they will be able to fund the construction of a new downtown school. Even though it is likely that the Province would fund most of the new school, the board will still need to come up with funds as well as justification in the face of potential community opposition. It has been 2 years since the original announcement of the school moving downtown, what if it is another 2 years before the board is ready to build? Additionally, the city is missing an opportunity to revitalized and enhance Water World. Given the recent announcement of the YMCA closing its fitness facilities in the Downtown that leaves Water World as the only gym facility in the city centre (to be fair, this announcement was made after this item was put on Council agenda). With the University moving downtown and hundreds of students likely following it, what are the odds that some of them will want to use a fitness facility without treking back to St. Denis Centre on the main campus? Yet administration is recommending to close/limit fitness hour when they should be expanding its operations. St. Clair College currently has an agreement for its students to use the YMCA at a reduced rate; has the city explored this option for Water World now that the Y’s gym is closing? 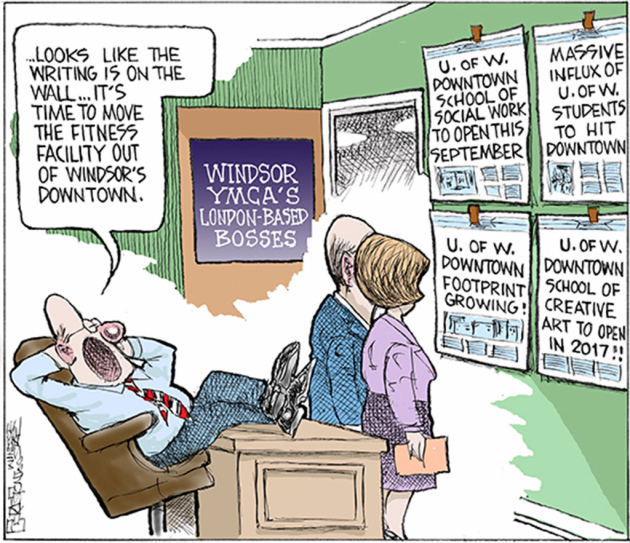 What about for the new U Windsor students coming downtown in 2016/17? What about for their own staff? The city can easily enhance its own business model for the facility, if directed by Council to do so. I don’t deny that Council has difficult decisions to make with the outcome dramatically impacting the City core. Regarding Pelissier Street, I generally agree with the Mayor that the city shouldn’t be a landlord in most situations, except to provide support for organizations that are doing community good like Windsor Pride and Canada South Festival Network. The idea of community hubs have taken off across the province, and communities are subsidizing not-for-profits in facilities to assist the overall well-being of the community. This street could be that if the city wanted it to be, a hub of not for profit activity. That being said, although I don’t know what is in the BIA proposal, if the city can transfer control of the commercial units to another party that ensures that the not-for-profit tenants have stability, they should! The removal of the commercial space in many ways runs contrary to the city of Windsor Strategic plan for building walk-able neighbourhoods and the principles outlined as apart of Mayor Dilken’s proposed Retail Development Corporation. As for Water World, it has been over two years since the arrangement between the City and Catholic School Board and no construction date has been set. What we have is a facility and neighbourhood being held hostage by an agreement that may or may not reach fulfillment. It is understandable why the city won’t invest in Water World as it might close soon; why invest in a doomed facility? I would argue it is time to re-examine the agreement with the Catholic School Board; if they cannot commit to a firm date of construction and completion the city should examine other options. In the mean time the city should take a proactive roll in Water World by following up with potential renters (those outlined in the report), and working with the University and College to ensure the viability of the fitness facilities. *Full disclosure: I have worked for CSFN in the past and currently interact with Windsor Pride through my work at United Way. As always the views in this blog do not reflect nor are endorsed by my employer.